(Nov. 5, 2000) Warner Music Group (WMG) and Echo Networks announced today that they have entered into a non-exclusive licensing agreement permitting Echo Networks to offer on-demand streams and downloads of Warner Music Group-controlled recordings through a subscription-based music service at http://www.echo.com and through co-branded music services developed by Echo for third-parties. 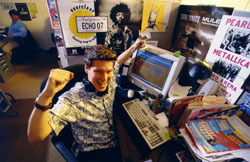 Echo plans to launch its first subscription offering in the first quarter of 2002. The announcement builds on the agreement the two companies reached in November 2000 when WMG became the first major music company to license Echo's community-based Internet radio service. Since then, Echo's service has received promotional on-demand streaming licenses from Arista Records, Jive Records and Verve Records. "Echo has been a pioneer in developing innovative Internet music services," said Paul Vidich, Executive Vice President, Strategic Planning and Business Development for Warner Music Group. "I'm confident that Echo's distinctive vision combined with its successful Internet radio service will make it a strong competitor in the emerging digital distribution market. We look forward to expanding our relationship with Echo and to offering our artists more avenues to reach their fans." "Warner Music Group has been an industry leader in its efforts to stimulate a legitimate online music market. As such, it has been a strong supporter of Echo, and has now extended our license to the world-class WMG catalog to our new on-demand music subscription service," said Tuhin Roy, Echo Networks' Executive Vice President of Strategic Development. "With this support, Echo has designed a unique and powerful music subscription service, one that engages consumers with a mix of community features, targeted music recommendations and on-demand music. The result is that Echo and our subscription distribution partners will have stronger and more profitable customer relationships than our competitors." Under the agreement, consumers in the U.S. will be able to search for their favorite WMG artists and to hear on-demand streams or downloads of WMG-controlled recordings either individually or as part of play-lists. The Echo.com and co-branded services will also offer consumers the opportunity to collect songs they hear on Internet radio channels for later on-demand playback. Echo Networks operates Echo.com, the largest and fastest growing interactive streaming music community. Since launching the Echo service in June 2000, Echo.com has signed-up approximately 750,000 members, has been named the "#1 Free Music Listening Site" by PC World Magazine, received the Editor's Choice Award and 5 Stars from PC Magazine and has been named a USAToday.com "Hot Site." Using Echo's proprietary music and instant messaging application, the Echo Music Messenger, Echo members can listen together, rate artists, vote on songs playing and instant message one another. Members can create new stations to share with the Echo community or listen to Featured Artist Stations where they hear music from their favorite artists and other songs rated highly by fans of that artist. Echo's investors include Revolution Ventures, Strauss Zelnick, former CEO of BMG Entertainment, Jeff Skoll, the co-founder of eBay and Ray Stata, founder of Analog Devices and Nexabit. Echo has signed licensing deals with Arista Records, Jive Records, Verve Records and Warner Music Group. Echo's competitors include MusicNet and Pressplay. Warner Music Group is home to some of the world's leading record companies, including The Atlantic Group, Elektra Entertainment Group, London-Sire Records, Rhino Entertainment and Warner Bros. Records Inc. The company's Warner Music International, with a roster of more than 1,000 artists, operates in more than 65 countries through various subsidiaries, affiliates and non-affiliated licensees. Warner Music Group also includes one of the world's leading music publishers, Warner/Chappell and WEA Inc., which is composed of three companies, WEA Corp., WEA Manufacturing, and Ivy Hill. Warner Music Group is an AOL Time Warner company.